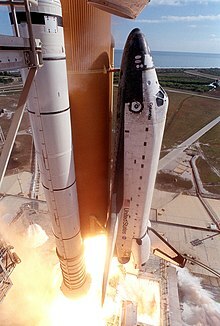 Space Shuttle Columbia, thought to be spaceworthy despite damage incurred during this liftoff, was destroyed by it upon re-entry. Spaceworthiness, or aerospaceworthiness, is a property, or ability of a spacecraft to perform to its design objectives and navigate successfully through both the space environment and the atmosphere as a part of a journey to or from space. maintenance of the spacecraft, after production, before and during each flight mission. Spaceworthiness is typically maintained through a maintenance program and / or a system of analysis, diagnosis and management of health and reliability of the spacecraft. Spaceworthiness of launch vehicles and spacecraft is an extension of the concepts of seaworthiness, for boats and ships, and of airworthiness, for aircraft. ^ Scott, H.A. "Spaceworthiness Exists" (search with CTRL+F for "spaceworthiness"). "Aviation Week" site. February 22, 2010. This page was last edited on 21 June 2018, at 02:21 (UTC).